Tey prátaðu enskt í Steinprenti í dag. Tað var har omanfyristandandi spurningur varð settur, men høvið var als ikki so dapurt og dramatiskt sum í kenda heitislagnum á seinastu útgávuni hjá Leonard Cohen. Spurningurin hjá prentaranum, Fríðu Matras Brekku, snúi seg heilt einfalt um violetta litin á einum prenti og finska listakvinnan, Anna Seppälä játtaði, at hon fegin vildi hava litin eitt sindur myrkari. Hetta var triðja prentið, sum Anna Seppälä hevur framleitt í Steinprenti saman við Fríðu Matras Brekku og Jan Andersson í hesum umfarinum. Eitt sera einfalt symbolskt prent við einum stiliseraðum hjarta við æðraforgreiningum og einum eyga í miðjuni. Reyði og violetti litirnir eru rættiliga bjartir eins og allar blómurnar, sum eru teknaðar í ymiskum bjørtum litum og síðani kliptar út og límaðar á eina myrka, málaða grund. Har er okkurt eitt sindur dapurt við hesum myndunum, tær eru annað og meira enn bara dekorativar. Lagið var gott í Steinprenti í dag, listakvinnan var sera fegin um avrikið, uppihaldið og um at framsýningin varð væl móttikin. Í morgin fer hon heim aftur til Finnlands, men hennara verk verða hangandi á framsýning í Steinprenti inntil 27.september. The question was posed today in Steinprent and the reason wasn´t at all as gloomy and dramatic as in the renowned title song in Leonard Cohens last record. The question came in fact from one of the lithographic printers in the Faroese Lithographic Workshop, Steinprent, Fríða Matras Brekku, who asked the Finnish artist Anna Seppälä if she wanted the purple colour in her print darker. Anna Seppälä confirmed that she wanted a darker tone in the purple colour in the lithographic print, which is the tird pring, she has created in Steinprent during this last week. It´s a simple and decorative symbolic drawing of a heart with ramifications of veines and an eye in the middle. Yesterday 31.august an exhibition by Anna Seppälä opened in Steinprent. 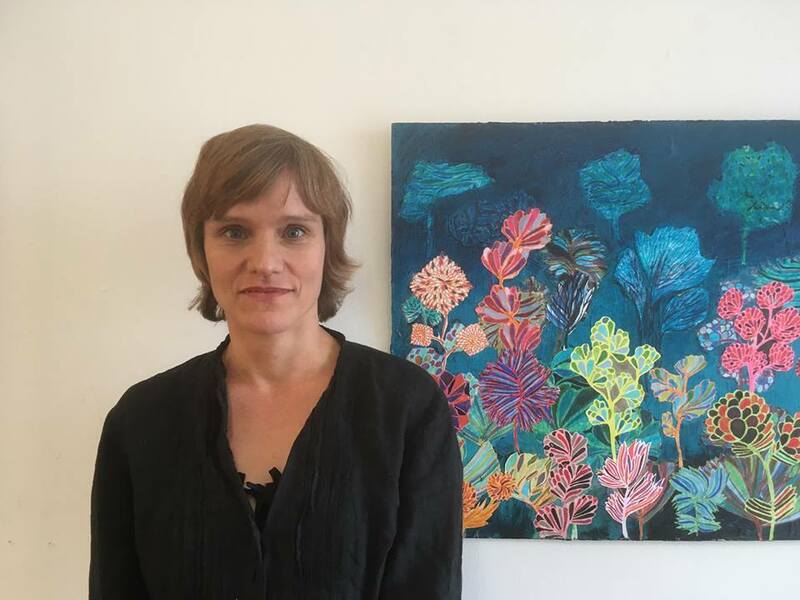 The artist has participated in group shows in Faroe Islands several times - first time in the St.Olaf Exhibition in Listaskálin some twenty years ago, but this is her first solo show in the Faroe Islands. Her motives derive both from a realistic and a mythical universe in collages on painted surfaces. These pictures seem somehow feminine, the collages are full of flowers, they are decorative and funny and at the same time a bit dark - maybe with a hint of the Memento Mori theme in paintings of the baroque era, where the flowers, fruit and beautiful objects intended to remind people of the inevitability of death. But the drawings, lithographic prints and collages by Anna Seppälä are all full of life and a firm believe in love as a forceful and fundamental power and the cohesive forces and universal likeness between humans, animals and plants and trees. The artist will go home to Finland tomorrow, but her exhibition stays untill september 27.